It is the end of the year my friends and I can’t think of a better way to end a great year of reviews than with 3 product reviews! Shoplet.com was kind enough to send me 3 office supply products shown below free of charge in the hopes I would share my thoughts with you. All opinions are 100% in own and may differ from yours. The rolling wrist rest is ergonomically designed to help reduce joint stress. Independent 360 degree wheel rotation makes it easy to work with your mouse or keyboard without lifting your wrist. Old methods die hard, so even though I have used the rolling wrist rest for a few days, I still find myself lifting my wrist more often than not. In time I may get used to utilizing it. I do find my wrist feels less fatigued just resting it on the wrist rest while I read online, so I do recommend this product for those of us that work a lot online, or on a computer. You can learn more about this product here. Microfiber, dual action Smarter Gloves are a smartphone users dream come true. No longer do you have to take off your glove to answer a call. These gloves provide any finger activation, touchscreen cleaning and are washable & reusable. Perfect for your tablets, readers, music, Navigation systems and more. I was excited to give these gloves a try during our last cold snap. I’m happy to report they really do work! I kept my gloves on to answer calls, clean my screen and share pictures on Instragram. I did have to take my glove off to text though because I grew frustrated with my misspelled words. As with the wrist roller, I think there is a learning curve and the more I use these gloves the more proficient at texting with them I’ll become. I like them and think you will too! You can learn more about this product here. For use on wood and wood laminates pieces like cabinets, doors, frames and more. 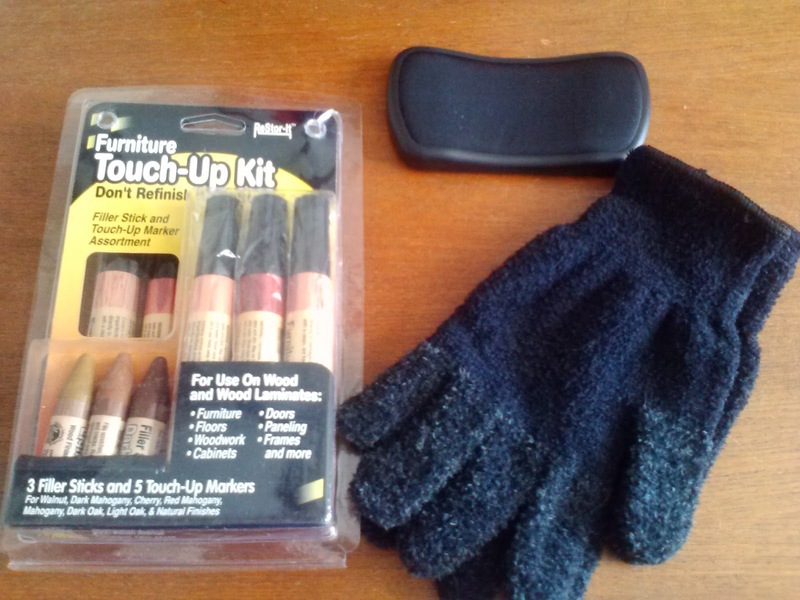 This set of 3 filler sticks and 5 touch-up markers fills and stains to restore beauty to furniture. I couldn’t wait to try this out on a few new dings our Cherry Entertainment center took over Christmas. Since my husband is a custom furniture and cabinet maker, I let him do the honors. He was very pleased with this set saying it is the most comprehensive touch-up kit he’s seen short of a professional one and he liked the way the product did what it was supposed to do quickly and easily. I loved the fact that I can no longer see scratches in my entertainment center. We do highly recommend this product! You can learn more about it here. That’s it folks- my last reviews of 2013. Thanks so much for reading them. I hope you found them helpful in making a purchasing decision. That is why I do what I do here on my little blog that could. Please share in comments if you have used any of these kinds of products before. Stay tuned for more reviews and giveaways coming soon in 2014. I think it’s going to be a great year! I've been very curious about the tech gloves, so glad to read your review and find that they do work! Will have to pick up a pair now. Thanks for sharing your thoughts! Awesome! I'm glad to hear my review was helpful to you.